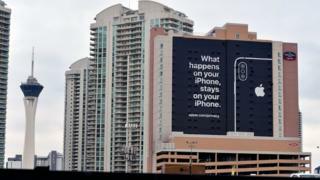 Apple placed this billboard at the recent Consumer Electronics Show in Las Vegas. Apple has acknowledged a flaw in its FaceTime software that allowed for brief eavesdropping – even if the recipient did not pick up. In some cases the target iPhone would send video, probably without the receiver’s knowledge. The company said it had developed a fix and an update would be rolled out this week. In the meantime, Apple appears to have disabled the ability for users to make group calls on FaceTime. In addition to audio, 9to5Mac reported that pressing buttons to block the call or turn off the device would result in video being sent to the call maker, without the recipient’s knowledge. On social media, concerned users – including Twitter chief executive Jack Dorsey – suggested disabling the FaceTime function altogether, which can be done via the device’s settings menu. Discovery of the flaw coincided with “National Privacy Day” in the US, a day heralded by Apple boss Tim Cook. “On this #DataPrivacyDay let us all insist on action and reform for vital privacy protections,” he wrote on Twitter. He said: “The FaceTime bug is an egregious breach of privacy that puts New Yorkers at risk. Apple also recently made a big play of its privacy credentials at the recent Consumer Electronics Show in Las Vegas.